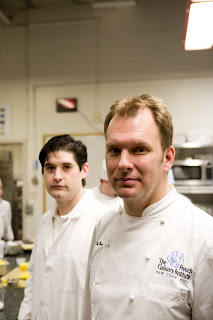 At the forefront of the food technology landscape are The FCI's own "food hackers," Dave Arnold and Nils Norén, who run the Culinary Technology program at The FCI. Once reserved for advanced students looking to master sous vide and other low temperature cooking techniques, their high-tech course offerings have expanded to the Recreational Division at The International Culinary Center. On June 12 from 6:30-9:30pm, the pair will teach High-Tech Cocktails, a three-hour demo and tasting class showcasing some of their latest innovations behind the bar, including an edible martini, and a fizzy "gin and tonic" made without the tonic. Adding to their growing press, High-Tech Cocktails has already received coverage on a number of NYC and food-related news publications. Most recently, a Village Voice article promoting the class included a few techie tricks of the trade from Dave Arnold himself. Another story on Cocktailians covered several techniques to be taught in class, breaking them down into "reasonable," "semi-reasonable," and "unreasonable" for the home cook to perform. Whether you're an experienced bartender or a curious home cook, High-Tech Cocktails promises to be an exciting evening. There's still time to register but space is limited, so reserve your seat before it's sold out! Read more about Dave and Nils' high-tech food experiments on their new "tech 'n stuff" blog, Cooking Issues.